A death, a curse, and a portal to hell awaits us for the second half of this amazing two-part story. Buffy the Vampire Slayer Season 2 Episode 22 had one of the best season finale endings for a TV series. This was true in 1998 and it's still true nowadays. Prepare yourselves for the emotional roller coaster that is the battle between Buffy vs. Angelus. This is going to be a heartbreaking day. Let's start rewatching "Becoming (Part 2)." Buffy the Vampire Slayer Season 2 Episode 22 aired nearly 20 years ago and I still will never understand why the cop shot at Buffy. She didn't have a weapon on her and only made a run for it. But yet, the cop took out her gun and shot at Buffy. Why did she do it? Did she think Buffy had a weapon on her?! This move could've been only for dramatic effect to add to the finale. However, the gunshot seemed out of place. There was no reason for it; she quite literally shot at a teenager simply running away. That move would've gotten the police officer fired. Buffy was lucky that the police weren't guarding Willow's hospital room after the attack. Usually after an attack, they might scope out the place to wait for the attacker to return. If the police had been monitoring the room, she never would've been able to see her friends and get the update. Cordelia made the smart move by running. Her fighting capabilities weren't the same as the others and based on the results (like Xander with his broken wrist and an unconscious Willow), she could've been killed. Giles fared the worst than all the others. His status was completely up in the air. When I was eight years old watching "Becoming (Part 2)," my initial prediction was that Giles was going to be killed. Angelus was talking about chainsaws and torturing him! Death seemed like an obvious possibility, and this was a season finale. All Angelus needed was the information to activate Acathla. Once he had that, he could've killed Giles! Whistler was pointless to the overall story. He had the equivalent of "filler" written across his forehead whenever he was on screen. The only benefit to having him in "Becoming (Part 2)" was that it saved time with the exposition. We got all the answers on how to stop Angelus without any of the research. He made things a lot easier so that we could focus on the meatier parts of the story. How he got that information? It didn't matter. He just KNEW what to do. And, based on what needed to happen during the season finale, this was the best approach with this minor character. Whistler served his purpose and faded into the night happily. Buffy: Alright, talk. What's the deal? Spike: Simple: You let me and Drus skip town, I help you kill Angel. Spike: There’s no with Dru. Spike: Dru bagged a slayer? She didn't tell me. Hey, good for her! Permalink: Dru bagged a slayer? She didn't tell me. Hey, good for her! Spike teaming up with Buffy was a surprising twist. His move was unexpected because for the longest time, he wanted her dead and seemed on board with ending the world. He came out of left field by stopping the police officer and teaming up to be a good guy (or at least a self-interested neutral baddie). Do you think Spike's action was more about stopping Angelus or that he liked Buffy? His affection for Buffy had been a longstanding discussion point; it emerged in full later on in Buffy the Vampire Slayer Season 5. However, before then, there were subtle hints that he didn't hate the slayer as much as we all thought he did. Based on his actions, I tend to go with the former here. He hated having Angelus back and he wanted Drusilla all to himself without his frenemy in the midst. Once he was off-screen in Buffy the Vampire Slayer Season 3, that's when his interest became more pronounced. Until then, we get one of the funniest shaky alliances to happen throughout Buffy the Vampire Slayer's run. Prepare yourselves for a cringe-worthy moment between Willow and Xander. Sure, this was also a touching moment that showed one friend giving their love and support to another in need. However, Xander's confession sparked a storyline that should've never happened. We didn't need a secret love affair between Willow and Xander during Buffy the Vampire Slayer Season 3! If only the spark didn't happen, we wouldn't have had to deal with the uncomfortableness that soon followed. Willow deserved better. Cordelia deserved better. Oz did, and even Xander. Joyce finding out the truth about Buffy was a long time coming. After experiencing so many supernatural events in Sunnydale, she needed to eventually find out the truth. There could only be so many amnesia and close call moments before it ventured into the realm of the unbelievable. At first she seemed like she took it well. She didn't scream when a vampire got dusted in front of her and she didn't jump to any conclusions. Also, her awkward conversation with Spike was strangely pleasant and she didn't react once Buffy made the deal to spare Drusilla's life. It all felt very cordial. Though, we're talking about Joyce here, the cordial attitude went downhill once the reality of the situation set in. If there was ever an allegory in Buffy the Vampire Slayer that represented the fear LGBTQ kids had coming out, this moment was best captured during Buffy the Vampire Slayer Season 2 Episode 22. Joyce went through all the cliche tropes of being afraid, asking Buffy to not be herself, and giving up the lifestyle or else she would be kicked out. The similarities fit perfectly to real life conversation; you know, except that this involved vampires. Joyce made a huge mistake in how she reacted to her daughter. Sure, finding out vampires were real and that your teenage daughter was the one girl in all the world destined to kill them was a hard pill to swallow. But, Buffy needed support then. It's a tough situation for anyone to handle. Buffy: I told you, I’m a vampire slayer. Joyce: Well, I just don’t accept that. Buffy: Open your eyes, Mom. What do you think has been going on for the past two years? The fights, the weird occurrences. How many times have you washed blood out of my clothing, and you still haven't figured it out?! Buffy: No, it doesn't stop! It never stops! Do you think I chose to be like this? Do you have any idea how lonely it is? How dangerous? I would love to be upstairs watching TV or gossiping about boys or, God, even studying! But I have to save the world...again. Permalink: Open your eyes, Mom. What do you think has been going on for the past two years? 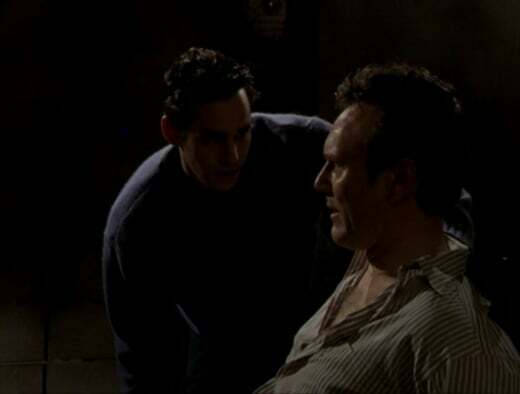 Drusilla messing with Giles's mind had to be one of the best scenes of "Becoming (Part 2)." Her magical supernatural abilities were never fully explained, but whenever she whipped them out, they caused a lot of devastation. She was a mastermind to use Jenny's vision to get the truth out of Giles. He wouldn't have revealed it any other way, even if he had been tortured by Angelus's chainsaws. The return of the woman he loved went right for the jugular and opened up his mind. You could see the look of shock on his face when he realized Drusilla had played him. Poor Giles, he didn't stand a chance when Drusilla dug deep into his mind. She had him eating out of the palm of her hand...or lost in a makeout session...whichever expression works for you. 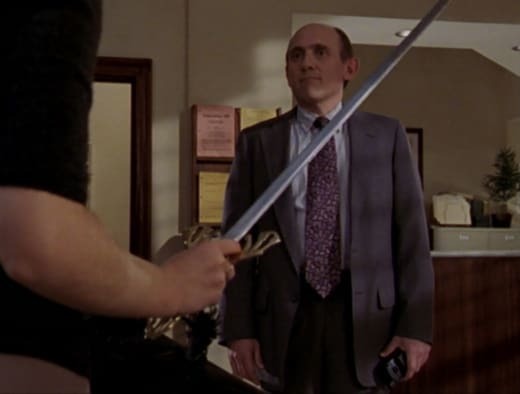 As we discussed in the rewatch for Buffy the Vampire Slayer Season 2 Episode 21, Principal Snyder would eventually get his day. The one time in all of Buffy the Vampire Slayer where he felt like a winner. This was his moment in the sun. He got the chance to expel Buffy. For that one fleeting moment, he had won. How many of you spotted the stunt coordinators during the fight between Buffy and Angelus? They were everywhere! Buffy the Vampire Slayer is a supernatural series about a group of people fighting monsters. These fight scenes happened a lot and we've seen our fair share of Sarah Michelle Gellar's stunt double doing the brunt of the work. However, for whatever reason, it seemed like the editing didn't want to keep up the pretenses anymore. Sarah's and David Boreanaz's stunt doubles were featured heavily during the fight scenes. In fact, we could actually see their faces while fighting! Seriously, take a look at who was in combat during the battle. This fight, while dramatic and action-packed, failed in keeping the illusion together. We want to believe Buffy and Angelus are fighting; not the coordinators. Angelus: And that’s everything. No weapons...no friends...no hope. Take all that away and what's left? Permalink: No weapons...no friends...no hope. Spike kidnapping Drusilla and taking off without helping Buffy felt true to his character. He didn't need to stick around to save her; he got what came for and could do whatever after the fact. Besides, he helped in the fight for a bit before the real battle began. It's a shame that Spike and Drusilla left the series for a while. Their presence was electric and they were a delight to have around during Buffy the Vampire Slayer Season 2. The pair provided the entertainment and whimsical fun while Angelus played the Big Bad evil foe. Sure, it's understandable why they had to be written out, but it was a joy to see Spike return. If only Drusilla had returned as well. That would've been a great time to see her become a recurring character again. Willow completing the soul curse had to be her first addictive taste of black magic. She lost herself in the moment and let the magic control her. From a character development standpoint, this scene started a complete character shift for her that would extend all the way to the end of the series. Who knew one spell would have that much power? 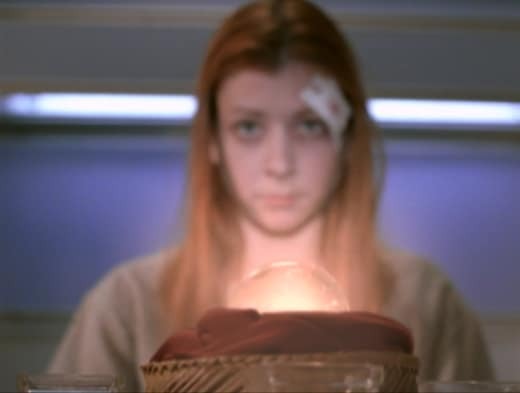 Well, looking back at Willow's witchy addiction, it all makes sense in hindsight. 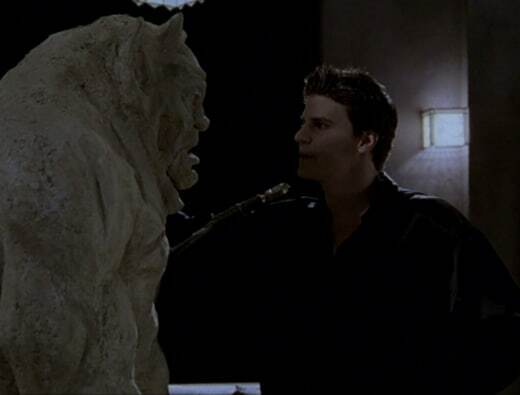 Angel: Buffy? What's going on? Where are we? I don't remember. Buffy: Shh. Don't worry about it. Who else tears up whenever you see Buffy reuniting with Angel...and then stabbing him? This is one of the most memorable scenes throughout all of Buffy the Vampire Slayer. As much as this couple didn't work in the grand scheme, you could always feel the love between them. Angel and Buffy shared many tender moments together, and their reunion was the most heartbreaking one yet. He didn't remember anything, but he felt empty knowing that he was somehow away from the person he loved. Buffy Summers has had a few truly selfless moments. Some of them included her committing suicide to save Dawn during Buffy the Vampire Slayer Season 5, and her venturing to fight The Master knowing it would kill her on Buffy the Vampire Slayer Season 1 Episode 12. Her stabbing Angel and sending him to a hell dimension is one of those moments. Though, what really made the ending to "Becoming (Part 2)" truly devastating was the song. Regardless of watching in 1998 or rewatching it now, the music paired with Buffy's heartbreak, Joyce reading Buffy's goodbye letter and the Scoobies waiting for her at school left me in tears. I'm never emotionally prepared for when the lyrics come in after Joyce finishes the letter. The progression of scenes left me gutted. While we knew that Buffy would continue into the next season, she was leaving Sunnydale behind on the bus. There was so much uncertainty for the series, especially with Angel "dead" and her leaving. This was a cliffhanger that left us at the edge of our seats...and crying. What did you think of "Becoming (Part 2)"? Did your heart break when Angel got sucked into the portal? Did you want to see more of Drusilla? Want to join us in rewatching Buffy the Vampire Slayer? We'll be posting new rewatch posts on Tuesday and Thursday. Come back here and let us know what you think of the episode.